At Lithia Chrysler Jeep Dodge Ram of Wasilla, our team strives to keep our customers informed about the models in our inventory. If you are in search of a heavy-duty pickup truck, the Ram 2500 is a popular model because it comes with an abundance of interior features that you can read about below. If you choose the available Uconnect 4C infotainment system, you can easily connect to music, apps, and more with Android Auto and Apple CarPlay. This infotainment system is paired with an 8.4-inch touchscreen that is user-friendly and the largest in its class. The Uconnect 4C NAV system also features safety and security features that include SOS Call, Vehicle Finder, and remote vehicle start. The available Ram Work Grade vinyl seats are durable and easy to keep clean, and you can also choose an available seven-inch information cluster display that features a speedometer, tachometer, fuel gauge, and more. 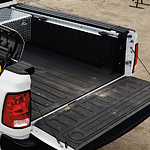 If you opt for the Crew Cab, then you get a standard in-floor storage unit.